Seeing a few strands of loose hair on the bathroom counter instantly makes your stomach churn. You look at the image in the mirror and see a bald person staring back at you. Before you start to panic, understand that hair loss is a normal part of life. However, that doesn’t mean you can’t be proactive in taking charge of this natural occurrence. Hair growth products are available for this very reason. A hair growth product focuses on stimulating the scalp and hair follicles. It awakens the nerve endings and initiates the process of hair growth. Any additional hair growth is stronger and thicker, and works with your natural hair to give your head a fuller, healthier appearance. A key to using hair growth products is having patience. Hair growth will not happen overnight. You should drink plenty of water, make healthy food choices and use multivitamins on a regular basis, in addition to utilizing hair growth products. It all works together to help hair regrowth take place. Take a look at some of the best hair growth products that are available for men. 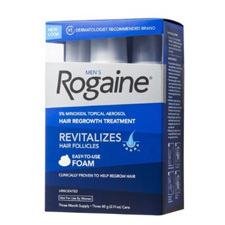 Rogaine for men is a household name and the one you probably recognize and think of first when considering hair growth product options. One of the products they offer is Rogaine for Men Hair Regrowth Treatment 5 percent Minoxidil Topical Aerosol. It is a foam that you apply to your hair each day. Take your fingers and massage the foam into your scalp, letting it air dry. Use it twice a day to start seeing noticeable signs of hair growth within two months. In a play on words of its competitor’s name, Lipogain offers a holistic approach to hair growth production. 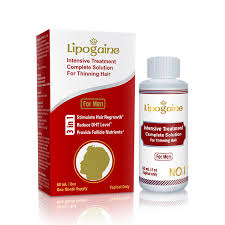 You should consider Lipogaine for Men. It is one of the only men’s hair care products to combine Minoxidil with Biotin. Additional ingredients are a blend of herbs and vitamins that come together to provide a hair growth product that you apply using a dropper and up to one ml of product solution. Apply this to your scalp twice a day to start seeing signs of hair regrowth taking place within the first month of use. 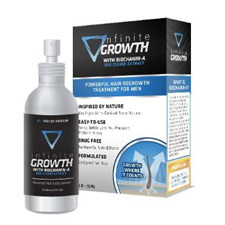 An all natural, drug-free hair growth product is available through Infinite Growth with Biochanin A. It is a hair care serum that makes your current hair thicker while initiating stronger hair follicle growth. The application is in the form of a nonaerosol spray that you use once a day for five weeks. You should start to see regrowth occur within two months of use. You should look at products that provide nutrients directly to your scalp. 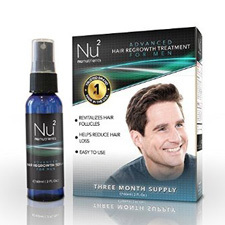 NuNutrients Advanced Hair Regrowth Treatment for Men works to nourish your scalp while also reducing any skin inflammation that may be present. It revitalizes hair follicles to promote the growth of stronger, fuller hair. Once new hair growth begins, the new follicles form a secure attachment bond on the scalp, which works to prevent future hair loss from occurring. The application is twice a day and you can either spray it directly on your scalp or place it in your hands and rub it on your scalp. Hair growth should become noticeable within one month of consistent use. There is another hair growth product available that requires the use of two products yet proves to be extremely effective. 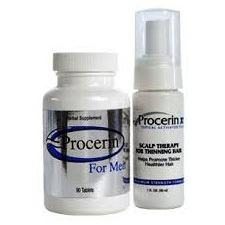 Procerin is a regrowth product that requires you to take a vitamin packed tablet twice a day and apply a serum directly to your scalp once as day. Each of these products works together to block DHT, a chemical responsible for hair loss in men. By blocking this chemical, the products form a combination that slows any current hair loss taking place. It also works to prevent future hair loss from occurring as well. These products are available over the counter so there is no need for you to set foot in your doctor’s office. That alone should be all the relief you need. After all, no one likes going to the physician. 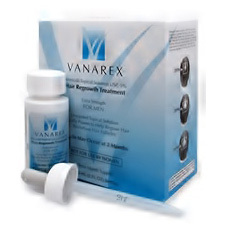 One of the best hair growth products for men comes in a three part system by Vanarex. Part one is an herbal supplement containing saw palmetto and works to block the creation of DHT. It also improves the overall health of your current hair and works to reduce any hair loss that may still be taking place. Part two of this system is a topical regrowth serum that you apply with a dropper once a day. Part three consists of shampoo that thickens and restores the health of your hair. You will start to notice a fuller head of hair staring back at you in the mirror within one month of use. At that time, if you are not happy with the visible results, Vanex will issue you a full refund. For a hair growth product to be effective, it must be easy to use. Men will find the Profollica two- step program easily fits in their already action-packed day. It works to fight DHT, the chemical responsible for hair loss, face to face. Part one is an herbal supplement full of amino acids, proteins, nutrients and other ingredients that attack DHT, preventing it from causing any additional hair loss. Part two is a serum that you apply directly to your scalp with a dropper. It contains natural ingredients that back up the vitamin supplement while providing the supplement support in the fight against DHT. When taken once a day, you should start to notice results within the first few weeks. 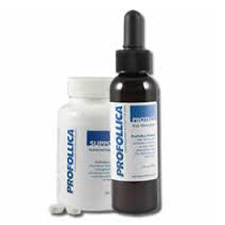 If you are not happy with what you see, Profollica offers a product refund within 60 days of the date of your purchase. Women experience periods of hair loss as well. Research studies indicate that approximately 60 percent of women deal with some degree of hair loss on a daily basis. Here are a few of the best products available to help you with this common issue. 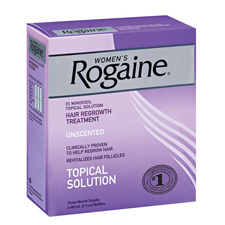 Rogaine makes a Minoxidil product for women that helps restore that healthy hair that you love. It is available over the counter in the form of a foam. You massage the foam into your scalp twice a day and let your hair naturally dry. Hair regrowth should start to become visible within six months of application and will continue to occur as long as you use this product. Women should take a look at Sephren, a two-part hair growth product system, as something that easily fits into a current daily health routine. Part one of this system features an herbal supplement that contains B6 vitamins that restore hair growth; Magensium that helps promote hair growth; and PABA, which encourages the presence of healthy hair pigmentation. Part two of the system is a topical foam you apply directly to your hair. Massage it gently into your scalp and let it sit for about five minutes. The topical foam conditions the scalp, repairing any damage present while also providing stimulation to the hair follicles. The two-part system directly addresses the hormonal imbalance that is often responsible for hair loss in women. The tablet supplement and topical foam are taken twice daily to see the best results. 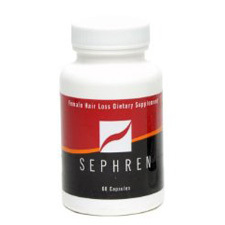 Sephren offers a money back guarantee if you are not happy with the visible results after three months of use. Women are constantly on the go, moving from one appointment to another and trying to juggle a million different things in the process. You need a hair growth product that easily fits in your daily preparation routine. 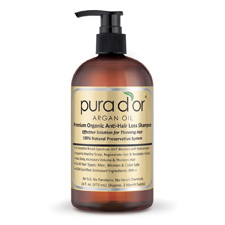 Look at Pura d’or hair loss prevention shampoo. It strengthens your hair, stimulates follicle circulation and works to give you a natural, fuller head of hair. The best part about this product is that it simply replaces the shampoo you are currently using. It adds no additional steps or preparation time to your morning routine. It is straighforward and easy to use each day. 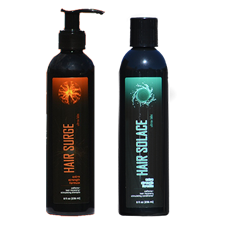 Another simple replacement for your current shampoo is Ultrax Labs Hair Surge shampoo. It works to initiate the hair follicle growth process while also nourishing the scalp. It contains essential oils, saw palmetto and ketoconazole to boost overall hair growth. You can use it every day to improve your hair texture as well. Noticeable results should appear within the first month of using this shampoo product. 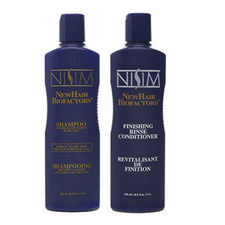 One of the best hair growth products for women is NisimBiofactors simply because it is easy to use and replaces the shampoo and conditioner you are already using. It means that you will not have to make an adjustment to your current daily routine to make time for this system. Part one consists of shampoo and conditioner that you use just like your regular products. Each product contains vitamins, minerals and amino acids that work to reverse the process of hair loss within the first week you being using the products. It also reverses any damage done by the regular use of hair products such as hairspray or styling gel. Part two is a topical spray that begins to improve the volume and texture of your hair from the first application. You will start to see your hair take on a healthier, fuller appearance almost instantly. You can rinse the spray out after use or leave it in your hair for extra conditioning. Nisim offers a full refund if you are not happy with your results at any time. Men and women both experience hair loss at some point in life. It is a natural, normal occurrence yet it can be extremely frustrating and stressful at the same time. While both groups experience the same problem, they require different solutions simply because the bodily triggers that prompt hair loss to take place are different. There is a hair growth product on the market that takes these similarities and differences into consideration when putting a regrowth product on the market. The Provillus hair growth product system is clinically proven to produce visible hair growth results within three to four weeks of use. It works to block the DHT chemical and replace it with nutrients that promote healthy hair growth. It also works to repair the damage done to hair follicles, paving the way for productive follicles to once again being functioning and promoting hair growth. The system is a topical spray that you apply directly to your scalp twice a day. Now sit back and let the product do its thing. It begins showering the scalp with nutrients, working to repair any redness or skin inflammation in the process. It strengthens hair follicles making it possible for healthy hair strands to begin developing. Each day that you use the product, you will see healthier, fuller hair staring back at you in the mirror. 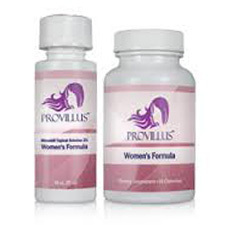 Provillus utilizes the same ingredients for men and women with this program. However, it does recognize that each group loses hair for very different reasons. Men typically see hair loss due to the presence of DHT, a chemical that prompts hair loss to occur. 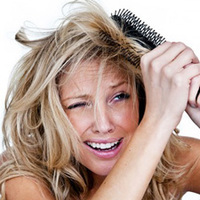 Women see hair loss happening due to hormonal imbalances in their body. With this in mind, Provillus provides two different versions of the same spray. Each packs the same beneficial punch. It just goes about it in a way that is the most effective for each group. After all, men and women do have more chemical differences than just DHT and hormones. Provillus offers a money back guarantee on its hair growth product system. If you are not happy with the results that you see, you can return the product for a full refund within the first 90 days of your purchase.